Paris' Velib' defined the first mega bike-sharing program with 20,600 bikes in the city and another 3,000 bikes in the suburbs for a total of 23,600 bikes in the metropolitan area. Alert reader Xin Zhou from George Mason University has informed The Bike-sharing Blog that Hangzhou, China is in the process of redefining the mega program with its plans to expand its existing program to 50,000 bikes and 2,000 stations by the end of the year, according to The China Internet Information Center. With 50,000 bikes, "[p]eople will find one service outlet every 100 meters downtown," states the article. Presently, stations in Paris are roughly every 300 meters.
" 'Public bicycle outlets will become as popular as public telephone booths along streets. In the future, residents will largely ride bicycles to go shopping in food markets and supermarkets, or to go to the office,' said Lu Zhihong, deputy general manager of the Hangzhou Public Transport Corporation. 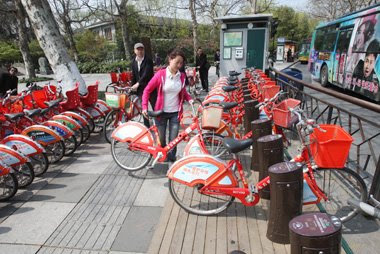 The state-owned Hangzhou Public Bicycle Transport Service Development Co. Ltd., which "is responsible for buying bicycles, setting out service outlets, and employing staff" has a new take on their proprietary bike-sharing system. A point-of-sale machine is imbedded into the bike. "Our leasing system is more convenient than that in Europe," said Zhihong. Healthy competition is always a good thing. UPDATE 8/3/09: Due to a translation error, the point-of-sale machine "imbedded into the bike" as described above is not actually part of the bike, but rather it is adjacent to the bike in a system that resembles Velib'. (Although the former method would be much cooler.) Customers may use the program's "Z card" or local transport "IC card" to rent a bike. Credit cards are not accepted on the system, rather only pre-paid cards. Paul, what do they mean by "A point-of-sale machine is imbedded into the bike" ? And do you konw more about the leasing model? The TIGER Roars in Washington, D.C.